Others may have heard of this scam but new to me so I thought I would post it in case anybody else has a similar phone call. I had a phone call from a private number. 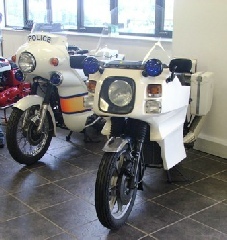 Bloke gave his name as PC Andy woods from Paddington Green Police , badge number EK206. He said they had a man in custody who had cloned my debit cards.Could I check I had all my debit cards. I was to ring National Fraud Helpline on 0208 9020943. They can cancel all my cards. I was not to use any cards or use online banking. The real Metropolitan Police know of this scam. If you google that number a few people have had same the same experience. Not harsh at all, disrupting peoples last few years of life is a "life crime" as far as I'm concerned. Someone told me of a similar one today. Telephone message saying that a close relative has been taken ill. Contact number given. Apparently the phone number is costing a fortune if you return the call. The Nuisance call blockers are becoming more and more popular and affordable. However a pensioner may not be savvy enough to understand setting them up. You can't trust emails or your phone anymore. And pensioners are so vulnerable. Last edited by Mark; 19th Feb 2016 5:46pm. Sounds promising. I am intrigued to see TalkTalk block 75 million nuisance calls per week.We are with Talk Talk and can enter a code to block the last number called. This is fine but is limited to 10 numbers and this particular call was a private number as are so many, so we have no chance.I see most people get at least one nuisance call per month. There are days when we get 6 or more including all the PPI and accident people.I guess this is because we are in more than many people. BT is launching a "breakthrough" new service aimed at diverting millions of nuisance calls. "Most people receive an unwanted telephone call every month, mainly about PPI or personal injury claims, automated marketing messages or sales. Now a BT team will monitor calls to our 10 million domestic customers and identify any patterns of callers. The "rogue" numbers will be diverted to a junk voicebox, which we estimate will affect up to 25 million unwanted calls a week. If you�re a BT customer, you�ll also be able to divert the calls yourself to the "Blacklist". The service will launch later this year, harnessing huge computer power to analyse data. Mr Petter called on other telephone providers to join the fight against the "menace" of nuisance calls, adding: "They can help us to root out the malicious players they may be hosting on their own networks when we identify dodgy and suspicious calling behaviour." An Ofcom spokesman said: "We've been working closely with communications providers to encourage them to implement innovative technical solutions to the problem of nuisance calls. 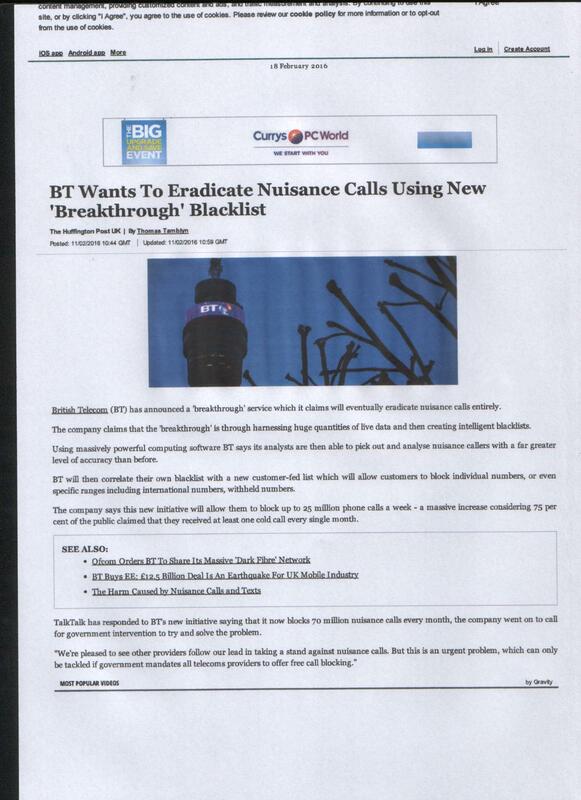 "We therefore welcome BT's plans to intercept nuisance calls on its network and reduce the harm caused to consumers." "
The Extras are never free with BT. Caller display to run a Nuisance type phone, free for 12 months then a monthly charge. Its sounds good, but not everyone is with BT. From personal experience the Nuisance Phones are 100%. Only family get through on my mums phone now, and she was vulnerable. Recently purchased the BT 8500 Advanced Call Blocker. Delighted with it as it has blocked 100% nuisance calls and only family and friends and the people we want get through to us. We were getting at least 5 nuisance calls a day between Nov and Jan from International Numbers - False numbers and Withheld numbers all is now peace. I welcome this BT initiative as I could afford a new phone but many many vulnerable people cant. Try registering with The Telephone Preference Service, I've found it works. Hi, I'm thinking about getting a BT 8500 to block nuisance calls, if I just bought one as the main 'phone would that serve to protect our extension 'phones? The BT Phones are DEC phones so only the main one needs to be plugged into the mains. Any Extra handsets need only a power point to charge but do not need to be plugged into an telephone extension. So anything else plugged into an extension phone socket would probably ring. The Main BT phone prevents any of the Nuisance calls ringing unless the number is on the allow list or the caller has pressed the hash key and said there name. The BT Nuisance Phone work as a group. Share contact details and block lists. They are worth every penny if your getting sales calls. You can add on a phone at a later date if you need to, but when i was pricing them it was �5- 10 difference for 2 or 3. Last edited by Mark; 19th Feb 2016 6:03pm.